Having been involved in Scottish salmon fishing since 1970 one of the most important parts for success is knowing how to set the hook when a salmon takes your fly. This vitally important & 'logical' discipline has always completely baffled me as even experienced salmon fishers today still fall 'well short' in this area of their game and many have a poor 'take to landed salmon' ratio. Somewhere at some previous point in time a disciple of the LFA (lost fish association) travelled the length and breadth of Scotland with a dreadful 'just lift into it' message and successfully paralysed the entire industry in a oner! Don't squander hard earned takes on the fly rod by thinking your fly hook will set itself correctly or the salmon will self impale itself so you can get a photograph together beside the river! As a professional salmon guide on the Tay regularly in charge of several fishers on a daily basis I've witnessed great opportunities to catch salmon lost by fishers who fail (or won't listen) in this very important discipline. This is very seldom properly discussed and in many cases left for the salmon to hook itself when the fish's objective very soon into the contact is to get rid of the fly! My personal advice when a salmon takes is never to lift into the fish with a soft actioned rod and slack reel clutch setting as logically there's little or no hook point pressure applied to the hook point(s) from doing so. Having ignored the initial tugs at the start of the take and once several seconds of fly line has been drawn consistently from your reel simply clamp the fly reel face and stop the line flow dead with the rod tip down and pointing in the direction of the fish. You'll then feel the weight of the salmon for a further few seconds which is exactly when you'll be setting the hook properly as the only thing between you and the hook points is the core stretch of your fly line. There's nothing worse in life than a limp fly line following a taught one so save yourself that anguish and keep your brain fed with the massive flood of neuropeptides all successful salmon captures bring! I'll repeat myself again to make sure this tactic is clear. Make sure the rod is pointing down in the direction of the fish when you clamp the reel face in order to maximise direct hook point pressure from the reel to the hook. After feeling the weight of the fish for at least a few seconds then release the reel and lift the rod. As you're tightening on the salmon at the optimal moment during the take quietly growl the words 'come here you'! 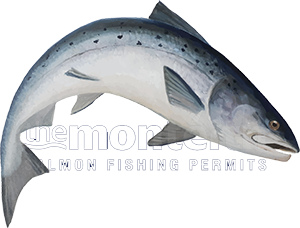 If this is all done correctly as detailed your fish will be hooked properly regardless of where the initial micro hold of the hook points were positioned in the soft or tougher tissue within the salmon's mouth as it turned on your fly. Logic will tell you all you need to know as to whether or not you've just added sufficient hook point pressure to your fly's hook(s) if you time this hook set procedure perfectly as the fish has turned and is swimming away from you. Allow your fly line to tighten up solidly for at least a few seconds (to combat the average 12% core stretch of poorer designed fly lines) before releasing your hand and only then lift the rod and by doing so I can assure you the only thing 'coming off' will be the landing net from your shoulder! This effective hook set method will allow the salmon's forward momentum & bodyweight to set the hook for you. In warmer Summer water the take will usually develop much more quickly than in the colder water of early Spring. In these colder water conditions allow a few more seconds before clamping the reel as the lower temperatures usually mean a much slower initial take and draw. Wait until the initial 'plucks and tugs' stop before you start counting as the fish hasn't turned at this stage of proceedings. Wait until the steady draw of line commences from your fly reel then start the stop watch. 7 seconds seems to work perfectly for me however that can be preceded by 4 to 8 seconds of 'tugs or nudges' which do not count! When a salmon turns properly on your fly don't 'rapidly' count these vital seconds and have the composure to 'agonisingly' wait until you're almost feeling that you've given the fish too long! That'll re-synchronise your adrenalin fuelled sense of time and bring you in pretty much on the desired '7 seconds of steady' draw target!